Hybrid bearings are non-conductive and therefore suitable for applications such as AC and DC motors and generators, where electric currents are present. The density of a silicon nitride rolling element is 60% lower than a same-sized rolling element made of bearing steel. Lower weight and inertia translates into higher speed capability and superior behaviour during rapid starts and stops. The lower frictional heat generated in hybrid bearings, especially at high speeds, contributes to extended bearing service life and extended relubrication intervals. 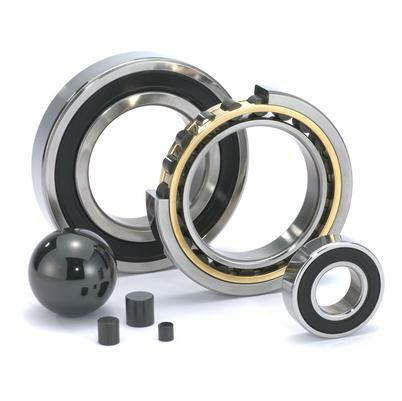 Silicon nitride rolling elements have a higher degree of hardness making hybrid bearings suitable under difficult conditions and contaminated environments. With a high modulus of elasticity, hybrid bearings offer increased bearing stiffness. Even under inadequate lubrication conditions, such as high speeds and rapid accelerations, or where there is an insufficient hydrodynamic film, the risk of smearing is reduced between silicon nitride and steel surfaces. For conditions where κ < 1, it is common to apply κ = 1 for hybrid bearing life calculations. When subjected to vibration, hybrid bearings are significantly less susceptible to false brinelling (formation of shallow depressions in the raceways) between the silicon nitride and steel surfaces. Silicon nitride rolling elements have a lower coefficient of thermal expansion, which means they are more stable over temperature gradients within the bearing and provide more accurate preload/clearance control.